How do I interpret PSG tab, what do the symbols mean? Hope this helps.My friend Hank Rodgers gave this to me years age. In the first diagram where three strings are fretted at the 5th fret with the B string fretted at the 5th fret which has an A next to it. Are all three strings plucked with pedal A depressed? Or are all three strings plucked and then the pedal A is pressed to raise the pitch? Also same questions for the notes next to these with A & B next to them and the ones next to them that have pedal B & C next to the notes. All 3 are plucked with the A pedal already engaged. If the writer wishes to have you pluck the string(s) without the pedal first and then engage the pedal afterwards, they will show it as a tied note. 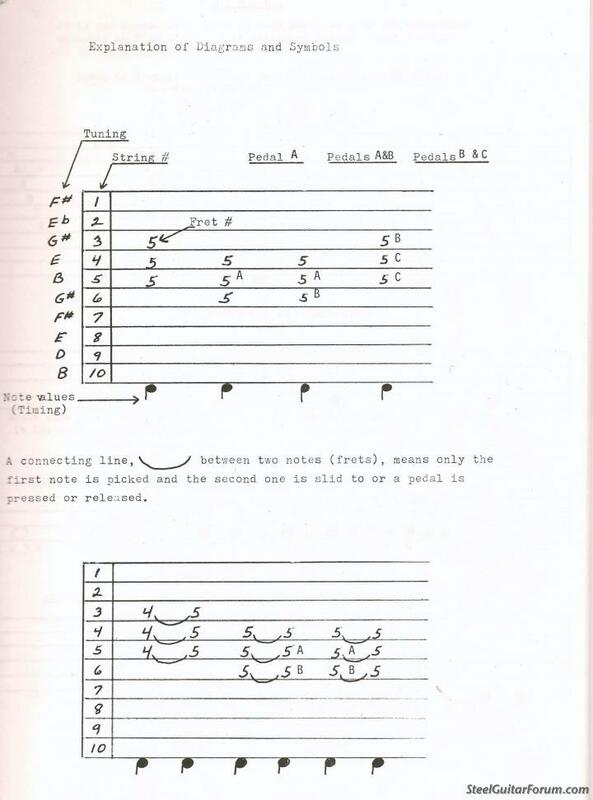 For example, in the second line of tab shown, the middle group has the 3 strings plucked at the 5th fret first without any pedal, and then adding in the A&B pedals after plucking. In the right-hand group, you pluck the strings again with the pedals engaged and then let off the pedals. The B&C pedal example (like the rest of the first line) has no going in or out of the pedals. They are engaged at the same time (or sometimes slightly before) you pluck the strings. I'm with you, cheers Jim. How are knee levers shown?? I've seen L or LL on the 2nd string - is that half and whole step flat? Different people show the knee levers in a few different ways, but if you've seen the second string on an E9 copedent shown as L or LL then, yes, that would mean 1/2 lower or whole step lower. After you learn some of these markings, you may find different ones such as: LKL meaning Left Knee Left, RKR right knee right…. The deal is that some guitars are set up differently than others. Just try yours to see what they do and compare it to the artist's tablature. My LKL raises the 8th and 4th string. My LKR lowers the 8th and 4th string. My RKL has a stop so that I can create a minor chord within the key fret. For example, if I'm in the 8th fret, no pedals, (C major), I can use my RKL stop (1/2 of the way in) to create C minor. That is not the original set up on the guitar. Some people also name the levers differently D, E, F,… Some pedals are in reversed order. Therefore, figure out what YOUR levers and pedals do to the strings, then compare it to the tablature. Even though we all have different ways of setting up and naming the knee levers, I believe each tab that is shared should include an explanation or tuning chart to let the "student" know what levers and pedals in the tab do what. My guitars a standard Emmons setup (haha- it IS an Emmons, after all!). The confusing part is looking in the Mel Bay book where the "G" lever (my RKR) is fine for string one, but forget about string 6! I play guitar, banjo, mandolin, dobro, pedal steel, so I guess a little detail like "where is the lower G natural on pedal steel" won't kill me! I just instinctively grab string 6.. I am prolly as green as anyone in this forum, 3 months at the PSG. Regardless how your guitar is setup, you should just know what lever changes what. Example, if I see lower string 4 or 8, I will use LKR (my E's are on the right knee, standard emmons setup) if I see that I need to lower my 2nd string a half tone, I will use the feel stop on my RKR, or if I need to raise my 7th string or 1st string a half tone (I know 7th string raise isn't used much anymore) I engage RKL. IMHO it's more about knowing your guitar and adapting the tab to what your copedent is. Richard, this should be required reading for all tab posters. Some kind of standardized tab publishing form with the copedent printed under the title and standard notation for timing would be nice too. Something that could be downloaded and plugged into our own editing software (like TablEdit) would be perfect. There's gotta be a geek among us somewhere that can do that. Fred that's a great idea buddy. The yime signature thing would definitely help when you don't know a song. Right now if you aren't familiar with a tune, most tab is just a bunch of jumbled numbers and letters. I think if there were a standard name for the levers, this would help too. But like I said, I prefer the tab that uses the arrows instead of the letter to show the changes, except for the ABC pedals. Can anyone recommend pig book w/ chord grips (major, minor,7th's,augmented,diminished). That is PSG not pig!! Mel Bay has an E9 chord chart by DeWitt Scott.